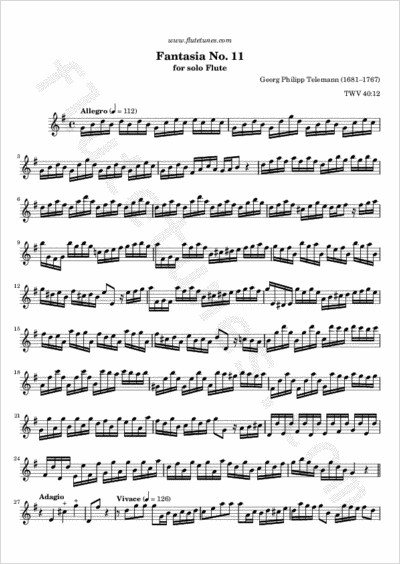 Telemann's eleventh Fantasia for solo flute is made up of three movements in the key of G major. The opening Allegro is a concerto-like virtuoso piece. It is followed by a five-note Adagio, whose second bar is incomplete in the original manuscript. This has led many modern editors to complete the bar themselves, and one may even play a full cadenza there, but a skillfully-played sudden interruption may work equally well. The Adagio is followed by a cheerful Vivace, which finally leaves place to a lively binary-form Allegro in 6/4 time.